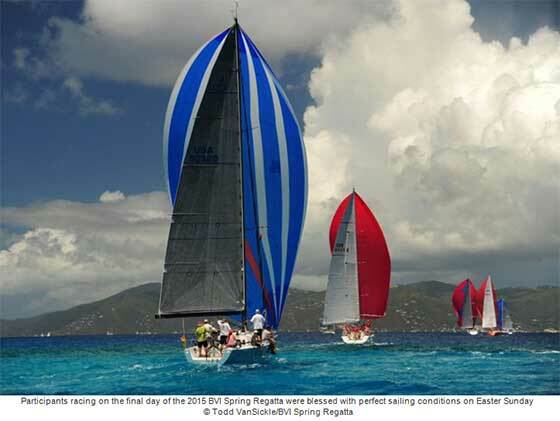 With no less than six races and as many as 13, the BVI Spring Regatta provides an extensive time on the water in gorgeous conditions, all in just three days of racing. This year the wind, waves and courses have varied every day, giving the participants a wide variety of exciting and challenging racing. While the majority of Europe and the United States are still in the grip of cold weather, it is no wonder that sailors from 14 different nations have come to the British Virgin Islands for the regatta. For the last day, sparkling blue water and constant warm breeze provided another day of gob smacking sailing in the BVIs. The Sir Francis Drake Channel was a wonderful sight with a myriad of spinnakers flying across the race area. In the first race of the day, about half of the fleet went around Salt Island, a stunning backdrop and an almost perfect top mark from the easterly trade winds. The One Design Fleets enjoyed a cracking skirmish just off Nanny Cay, the gentle breeze was funnelling down to the course, which was just enough to send the Melges 32s on the plane downwind. "If you has asked me if we could win before the start of this regatta, I would have said no. My ambition was to just figure out how to steer the boat without hitting anything expensive," admitted Ola. "I am really surprised, but Team Varg has an Olympic Gold Medallist and many World Champions racing, so it is a really good team. The crew have been pushing me really hard, right to my limit and a bit beyond. This has been a fabulous regatta, the venue is fantastic, but I have been focusing on driving and not really looking at the scenery. However next time, I will look around - I will definitely be back." Tony Mack's Team McFly racing J/122, El Ocaso was the winner with First 40, Corr's Light Racing /Southern Child, second. Rupert & Jan Thouron's J/122, Dunder finished the regatta on a high, winning the last race to claim third: "We have had such a lovely time; the weather has been just glorious and when we had a chance to look around, the scenery here is just amazing. We were playing Cold Play's Paradise on the way in and it was a very appropriate song. No matter what class of racing you are in, there is really competitive sailing. We may have won here, but in just about every race there was always several boats in with the chance of glory. We had to sail really well; we didn't walk this by any means. This has been a great start to our season; concentrating three races in a day, we have spent more time on the water than we could have possibly done at home," said Tony Mack of Team McFly's win. Dave & Debbie Clasen's Tartan 10, Windemon was victorious in class: "We have an incredible crew that make things easy for us," exclaimed Dave Clasen. "This year, the regatta was interesting because we had a mixture of conditions. It was blowing really hard on the first day which led to leftover lump in the water that was a real challenge for us to shift gear and adjust for that. We really struggled in the first race, but we just stuck with it and ended up with a 2nd place finish in the first race. Again it was different conditions today; it was much lighter which was also challenging for us, but we had a little margin and we came out and sailed very well again and we are pretty happy with our results.The Race Committee did an awesome job like always. They set challenging courses and it's a very difficult regatta with many different conditions and types of courses. Our thanks go out to the Race Committee and organisers of the event and probably more importantly, to our crew. We have the best crew that you could imagine. We will be back next year. I don't think our crew will let us say 'no'. Colin Rathbun's Tortola Express retained the one-design title won last year. Colin was quick to praise the team on board. "It is all down to teamwork. Manoeuvres have to be slick in one design racing, one bad tack or mark rounding and you are history and I love racing with these guys - it is a lot of fun. Saturday was a great day for us with straight wins and that really set us up for a conservative approach today. We didn't need to push hard at the starts, we knew that if we made top three then we would win the regatta and to be honest that has been like that all week." Luis Juarbe's Soca won two of today's races to win the class from Jaime Torres' Smile and Wave with Sergio Sagramoso's Lazy Dog claiming third. Soca and Smile and Wave have too distinct styles of racing downwind. Smile and Wave tend to sail straight at the bottom mark, while Soca likes to sail wider angles - soaking, which means a greater distance to sail, but at a faster speed. "Soca was soaking!" laughed Luis Juarbe. "It is so nice to be here, this is a terrific place to race Melges 32 with warm water, heavy air and big waves. 25 knot of boat speed on the runs blasting downwind was a regular thing. These boats can handle it, sending it all the way down the waves is super nice and it is a lot warmer here than the East Coast of the States. This has been super nice, impressive racing, really tight competition, non-stop dog fighting, all the way. On the last day, anything could have happened." 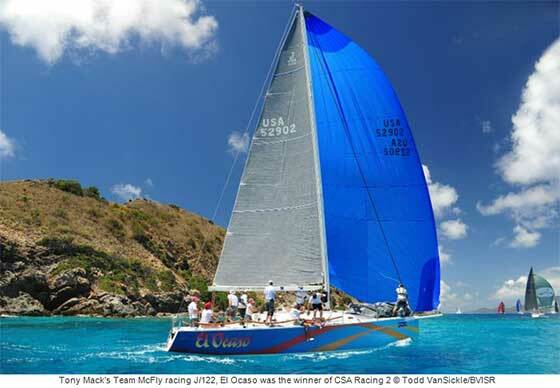 Trimaran Triple Jack, skippered by Tortolan Ryan Wooldridge, scored a perfect six bullets to follow on their line honours victory in the Round Tortola Race. Jonathan Pooley from Guernsey was the winner of CSA Multihull 2, racing Outremer 51, Escapade to victory by a single point from sistership, Archer owned by Richard Palm from Rockland YC, Maine. Ross Applebey's Oyster 48, Scarlet Oyster was the winner of Performance Cruising 1 ahead of Giles Redpath's Grand Soleil 56, Shine and Christian Reynolds Swan 51, Northern Child. In Performance Cruising 2, the young team from St. Croix racing Stanford Joines' J/36, Paladin was the winner by a single point, after scoring five straight bullets after a disrupted start to the regatta. "We only had six crew for the regatta, normally I would have 12," said Ross Applebey, Scarlet Oyster. "So everyone had to really get stuck in all the time. It has been hard work and as a result we have been going to bed a bit earlier than usual. Some of the crew have an early flight to catch home to England but I am sure we will find the time to celebrate tonight. It is great to have another win on Scarlet Oyster and I am so pleased for the team because they deserve it for the effort they have put in." 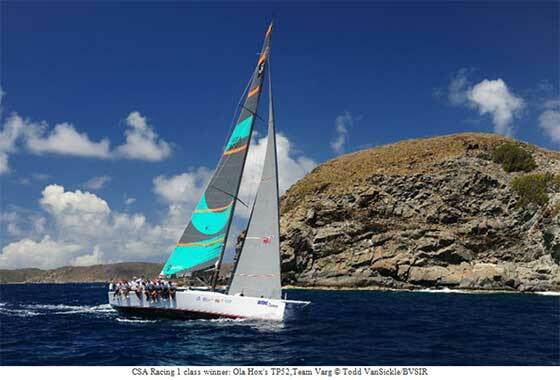 Bob Beltrano's Swan 53, Nai'a was the winner scoring no lower than second in the six race series. Steve Schmidt's Santa Cruz 70, Hotel California Too was second and Ossie Stewart's family racing Dufour 40, Island Girl had a first and a second in the last two races to claim third. 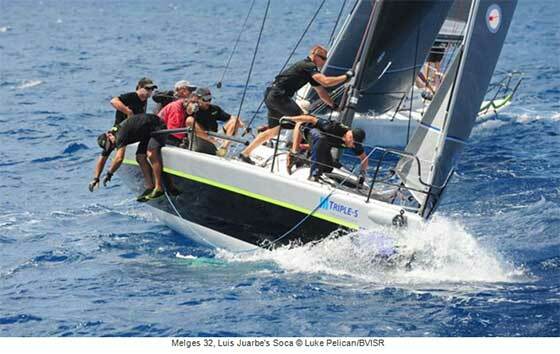 "This is our fifth time in the BVI Spring Regatta and the best one yet," commented Bob Beltrano. "The organisation was flawless, the courses and shoreside were just beautiful. We rounded islands for the most part, which is exactly want we want, a really great three days of sailing. This regatta has grown through recommendation. There's ample docking and the facilities here are good, everything is in one place. It's not a travelling roadshow, we travel by racing, unlike some of the other regattas where logistically, they're much harder to do. This one is simple because everything is provided, it's our favourite regatta." Keith LiGreci's Jeanneau 40, Girasoliscored no lower than second in the eight race series to win the class. Robin Tattersall's 30 Meter, Diva won the last race but came second by just three points and William Bailey's Hughes 38, Second Nature was third. "It's the crew, it's always the crew," commented Keith LiGreci poolside in Nanny Cay with a Mount Gay Black & Stormy in his hand. "The win is all down to the crew. I don't have to do anything on the boat. They all know what to do, they do their jobs and they do them well and the boat goes fast. That's all, it's simple. These guys are almost professionals, I consider them pros. I like to cruise my boat and I like to push it to its limits and see what it can do. I want to push myself, the boat and the crew, and they respond superbly, they really do and it makes me a happy camper." In the Bareboat 1, Charles Garrard's Team Merlin from the Boston Yacht Club scored six straight bullets to win the class. Iskander Rahkimov's Team RRC One was second and Jim Proctor's Teranga third. Scott Alexander from Team Merlin was full of praise for the BVI Spring Regatta: "The first day was survival conditions and to jump into a charter boat and be able to handle the boat and the sails was really challenging. We were hoping there weren't three days like that! The Race Committee did an amazing job, we will definitely be back next year. We normally do a Caribbean regatta every winter and this one has truly been our favourite because it is well organised. The islands are beautiful and the sailing has almost guaranteed breeze - it's just good mojo." In Bareboat 2, Nils Boegborn Dutch team from the KNWV Yacht Club was the class winner on Boat 9/Ghalazio 2, after a highly competitive series of six races and also won the 5th annual International Yacht Club Challenge and were awarded a free charter on a Sunsail boat. Andrew Thompson's Salcombe YC team on Bonjour Matelot was second with Rob Swain Sailing's Lazy Daze from Nanny Cay in third. The Awards Ceremony for the 44th BVI Spring Regatta was held on the stage in front of a packed Nanny Cay Beach. Mocko Jumbies entertained the huge crowd after racing and later in the evening Chef Al & the Hot Sauce Band by Absolut took to the stage and lit up the dance floor. A full list of Prize winners will be posted after the festivities are over along with photos from tonight's Spring Regatta Awards Ceremony.